Callan holds a sample of basement complex in Wyoming’s Teton Range. Callan Bentley is an Assistant Professor of Geology at Northern Virginia Community College (NOVA). He is a D.C. native, born in the city and raised inside the Beltway. 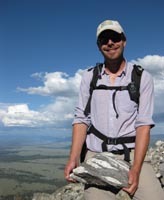 Callan studied geology at the College of William & Mary (B.S., 1996) and at the University of Maryland (M.S., 2004), and science education at Montana State University (M.S.S.E., 2009). He is interested in structural geology, paleontology, climate science, Rocky Mountain geologic history, and most particularly the geologic history of the Appalachian mountain belt. Callan has traveled widely, including time in 30+ foreign countries and all 50 U.S. states. He has taught full time at NOVA since 2005. Callan is the recipient of the 2018 Jim Shea Award from the National Association of Geoscience Teachers, and was elected a Fellow of the Geological Society of America in 2017. He was also awarded the 2015 Outstanding Faculty Award from the State Council of Higher Education in Virginia, the 2014 Biggs Award for Geoscience Teaching Excellence from the Geoscience Education Division of the Geological Society of America, the 2013 President’s Sabbatical Award from Northern Virginia Community College, and the 2012 Chancellor’s Award for Teaching Excellence from the Virginia Community College System. During the 2015-2017 academic years, Callan served as Chancellor’s Commonwealth Professor. He is a Contributing Editor for EARTH magazine. For more information, please visit Callan’s NOVA website. Since 2012, Callan, his wife, and their son make their home in the Fort Valley of Virginia, ensconced in the woods on the eastern limb of the Massanutten Synclinorium.